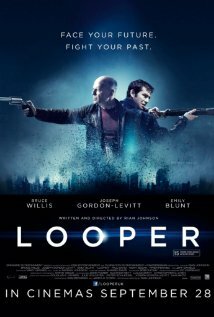 Yet another movie where I find myself struggling to decide who I should be rooting for, or even who I want to root for, Looper is one hell of a fun ride. After time travel is invented and promptly outlawed, the mob uses time travel as a means of disposing of bodies (which has apparently become too difficult to accomplish in the future). Present day (well, it would seem slightly in the future day, as the movie takes place in the near future) hitmen do the dirty work for their in-the-future bosses. Until something changes in the future and their targets start to frequently become their future selves with alarming regularity. Time travel hijinks ensues and the moral dilemmas begin to pile up. Generational struggles have never been like this before! And then there is “The Rainmaker”, a future leader who has started the whole chain of events which lead to the struggles at hand, our main plot points. But, as with any film dealing with time travel, is “The Rainmaker” the cause of these events, or is he an effect of the very same events… ? I won’t give away much else since there’s a good chance many folk haven’t seen this one yet, but I highly recommend it for the deep introspective the film forces one into. More than just a sequence of chase and shoot-em-up scenes (although there are some of these too), this film really gets into the issues of self and motivation, and of sacrifice, and presents them in such a novel and entertaining way it would be a shame to miss it. And of course, there’s some classic Bruce Willis mayhem to be had! Funny enough, even though they really aren’t alike (the mood is completely different), I did find myself reminded of The Terminator while watching Looper at times… Strange.